International trade has become a focus of political debates in the US and around the world, but while previous studies focus on the job-reducing effect of the surging imports from China or other low-wage countries on the US employment, the job-creating effect of exports has receive much less attention. This column employs two approaches – an instrumental variable regression analysis and a global input-output approach – to argue that the negative effects of import competition on US employment are largely balanced out once the country’s job-creating export expansion is taken into account. One of the most drastic changes in international trade in the last 30 years is the rise of China. Imports from China accounted for only 1% of total US expenditures on manufacturing goods in 1991, but this figure is now around 10% (Autor et al. 2016). Conventional wisdom in economics is that trade has beneficial effects overall through a reduction of consumer prices, greater number of available varieties, resource reallocation towards more productive industries and firms, and scale economies. However, ongoing debate on the impact of trade with China tends to focus more on the negative effects on manufacturing employment (e.g. Autor et al. 2013, 2016, Acemoglu et al. 2016, Pierce and Schott 2016). Acemoglu et al. (2016) investigate the relationship between an increase in imports from China and the decline of US manufacturing employment. Their central estimates imply that a decline of 2 million manufacturing jobs during 1999-2011 was due to imports from China. While these studies focus on the impact of imports from China on US employment, the positive effect that US exports have generated on employment has been much less explored. The US is one of the leading exporting countries in the world trading system – in 2014, the value of its merchandise exports reached more than $1.6 trillion, second only to China. Figure 1 shows that the total exports-to-GDP ratio in the US increased from 8% to 18% during 1995-2011. No doubt such an expansion in exports has generated increased demand for labour. In recent papers, we therefore provide the first account of the positive effect of export expansion in the US, through an instrumental variable regression approach (Feenstra et al. 2017) and a global input-output approach (Feenstra and Sasahara 2017). Source: Feenstra and Sasahara (2017). Data from the WIOD. In Feenstra et al. (2017), we examine the employment effect of US export expansion at both the industry level and the local labour market level. Export expansion from the US was not evenly distributed across industries, with semiconductors, motor vehicles, and petroleum refining experiencing the largest increase in exports over 1991-2007, and much smaller export growth in other industries. This creates large variation for our data at the industry level. Industries that experienced export expansion received job gains, while industries that were more exposed to foreign imports suffered from job losses. Industry-level estimation, however, cannot account for cross-sector reallocation and local demand in general equilibrium, so we follow Autor et al. (2013, 2016) and also explore the variation across local labour markets (commuting zones). 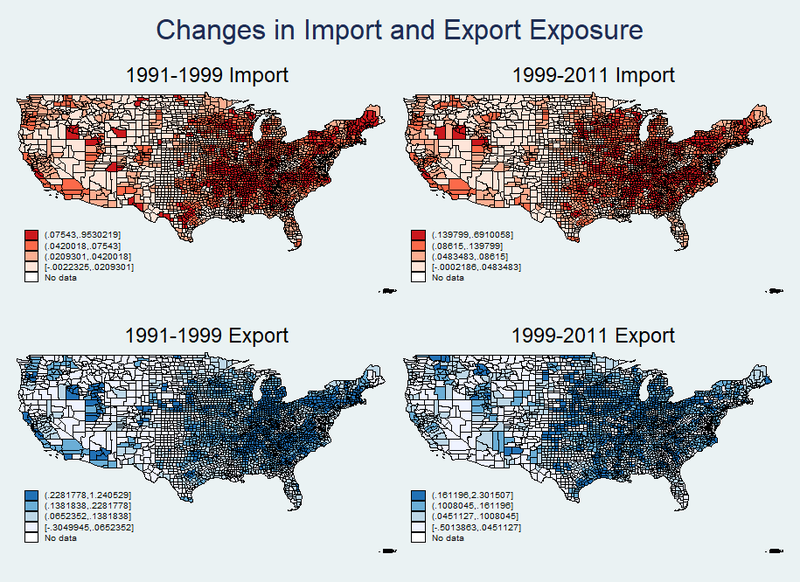 Figure 2 presents a comparison of the regional exposures to imports and exports over 1991-1999 and 1999-2011. Source: Feenstra et al. (2017). Empirically, it is not easy to obtain unbiased estimates of the effects of export expansion due to endogeneity. Uncontrolled (often unobserved) domestic supply or demand shocks can affect exports and employment simultaneously, leading to bias in estimation. Lack of plausible instruments probably explains the lack of more empirical evidence on the effects of export growth. We deal with this challenge by adopting two instruments. First, we follow the spirit of Autor et al. (2013) and consider the export expansion of other high-income countries to foreign markets as an instrument for US exports to those markets. Second, we derive an export equation for the US exports to each foreign market, based on a constant elasticity, monopolistic competition framework. This model provides us a second instrument that is the predicted US exports based on the foreign demand for imports from other countries, tariffs that the US faces, and the tariffs that other competing countries face in each foreign market. Our empirical results show important job gains due to US export expansion. We find that although imports from China reduce jobs, the global export expansion of US products creates a considerable number of jobs. Based on the industry-level estimation, our results show that on balance over the entire 1991-2007 or 1991-2011 periods, job gains due to changes in US global exports largely offset job losses due to China's imports, resulting in about 300,000 to 400,000 job losses in net. Estimation at the commuting zone level generate even bigger job creation effects: in net, global export expansion substantially offsets the job losses due to imports from China, resulting in about 200,000 net job losses over the period 1991-2007, and a roughly balanced net effect if we extend the analysis to 1991-2011. One advantage of the input-output approach is that it is easy to extend the analysis to other sectors such as services and natural resources. Our results show that, when focusing on the manufacturing sector and the natural resource sector, the net effect of overall trade with all countries in all sectors is slightly negative: 80,000 reduction in demand for jobs in manufacturing, and a 250,000 job reduction in the natural resource sector during 1995-2011. However, when looking at the service sector, we find a substantial net job gain, with a 1.03 million increase in the demand for jobs due to overall trade with all countries. This is large enough to compensate for the net job losses in the manufacturing and natural resource sectors. After taking all of these into account, the net effect of overall trade with all countries led to a net increase in labour demand of 700,000 jobs. Table 1 summarises the estimates from Feenstra et al. (2017) using the regression approach, and from Feenstra and Sasahara (2017) using the global input-output approach, depending on whether total US exports are compared with imports from China or with imports from all countries. Source: Calculations from Acemoglu et al. (2016), Feenstra et al. (2017), and Feenstra and Sasahara (2017). Acemoglu, D, D H Autor, D Dorn, G H Hanson, and B Price (2016), “Import Competition and the Great US Employment Sag of the 2000s”, Journal of Labor Economics 34(S1): S141-S198. Autor, D H, D Dorn, and G H Hanson (2013), “The China Syndrome: Local Labor Market Effects of Import Competition in the United States,” American Economic Review 103(6): 2121-2168. Autor, D H, D Dorn and G H Hanson (2016), “The China Shock: Learning from Labor Market Adjustment to Large Changes in Trade,” Annual Review of Economics 2016(8): 205-240. Feenstra, R C, H Ma, and Y Xu (2017), “US Exports and Employment”, NBER Working Paper No. 24056. Feenstra, R C and A Sasahara (2017), “The ‘China Shock’, Exports and U.S. Employment: A Global Input-Output Analysis”, NBER Working Paper No. 24022. 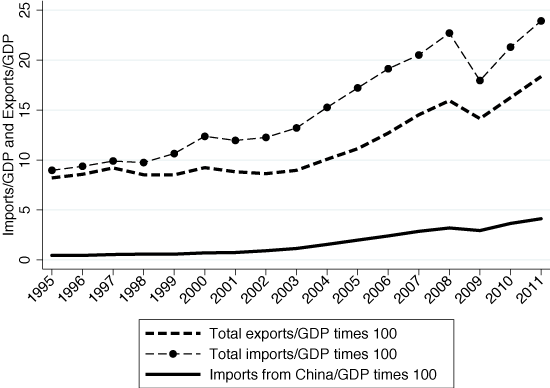 Los, B, M P Timmer, and G J de Vries (2015), “How Important are Exports for Job Growth in China? A Demand-Side Analysis”, Journal of Comparative Economics 43(1): 19-32. Pierce, J R and P K Schott (2016), “The Surprisingly Swift Decline of U.S. Manufacturing Employment,” American Economic Review 106(7): 1632-1662.